Do you want a pet zone that smells fresh and clean no matter what a dog does there? Our non-toxic pet odor neutralizer is a spot spray that is safe for animals of all sizes. It gets rid of pet smells in home yards, and in high traffic areas like kennels, dog runs, dog parks, vet clinics, and boarding hotels. It’s a bioengineered blend of natural bacteria that is not like any other item you can buy. This unique pet odor neutralizer breaks down waste before it can start to smell, with a natural army of more than 250 billion microorganisms per gallon. The blend in this spray can stand up to tough weather year round. It will still get the job done at high temperatures of up to 200 F. Odor control spray is just one of the turf accessories you can find at Watersavers Turf. 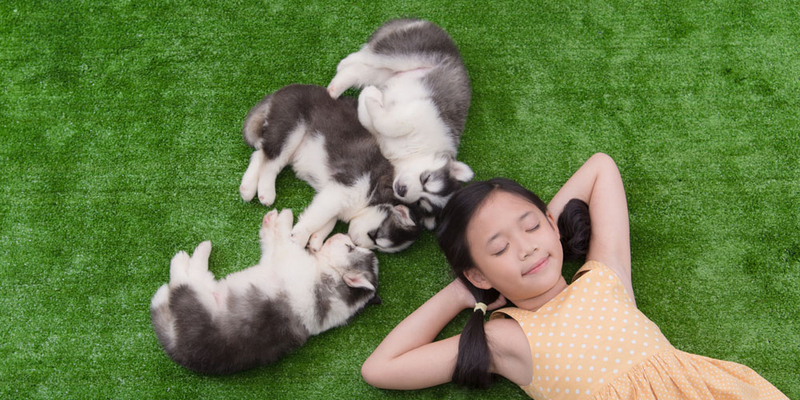 We have all the goods and tools you need to install and care for faux grass in your dog zone so that it looks great and smells clean for years to come. 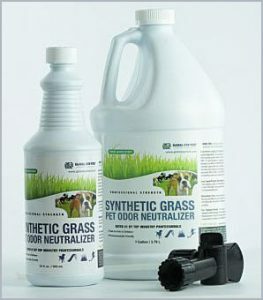 Our pet grass deodorizer is a live liquid enzyme mix that digests waste. Tests show that it cuts the oxygen needs of waste by 80% in 5 days. That means the natural bacteria in this spray takes smells apart cell by cell. All you need to do is dilute it at the rate of 2 oz. per gallon of water, spray it on your fake lawn, and let it do the work for you. It will start to break down waste and odors right away. Some products will just cover dog waste odor, but that’s not a good solution for you or your pup. For one thing, think of your dog’s health. Many perfume and scent products are not animal safe. Dogs like to lick and sniff the ground, so what you put on your turf for odor control can end up in your pet’s mouth. That’s why we’re glad to stock this spray that is free of any dye or scent that could harm your furry friends. It has no acids, solvents, or caustic agents, and the enzyme blend is 100% natural. That’s why this pet grass deodorizer is safe to use as often as you would like! You can use it every day of the week and your lawn will still be safe for animals, kids, and adults to play on. Not that you’d have to use it that much, thanks to how fast pet grass moves away waste in the first place. All types of faux grass beat live lawns for odor control since turf drains more quickly and more fully than natural sod does. That means smells don’t sit as long or stay as strong on a fake lawn as they would on live grass. Even so, where you find dogs, you are bound to find some odors. That’s where a spot spray comes in to save the day with a quick blast of help. Contact Watersavers for any of your pet turf needs. We have a full range of all the tools you could want to install a faux lawn. We offer more than 60 styles of turf with top quality pet grass that’s great for home and commercial use. Get a free Watersavers quote, visit one of our stores in the SF Bay Area, or give us a call at 844-974-8873.